Anyone who raves about Jimmy John's apparently has never eaten a sub anywhere else! Growing up in eastern Iowa and then spending eight years in Kansas City, I loved Jimmy John's. Their Italian Night Club was my favorite, and I loved getting a loaf of their leftover bread for pennies. I considered them to be far better than Subway or Quizno's, and on-par with Firehouse. After living in Connecticut for a couple of years, though, my standards have changed. This state knows how to do sandwiches, and even the biggest regional chain (Nardelli's, as far as I can tell) puts out stuff that easily kicks JJ's to the curb. There's just no comparison; sandwiches, especially the Italian kind with lots of cured salty meats, are a tradition here and it shows. No one can fault you for what you didn't know. 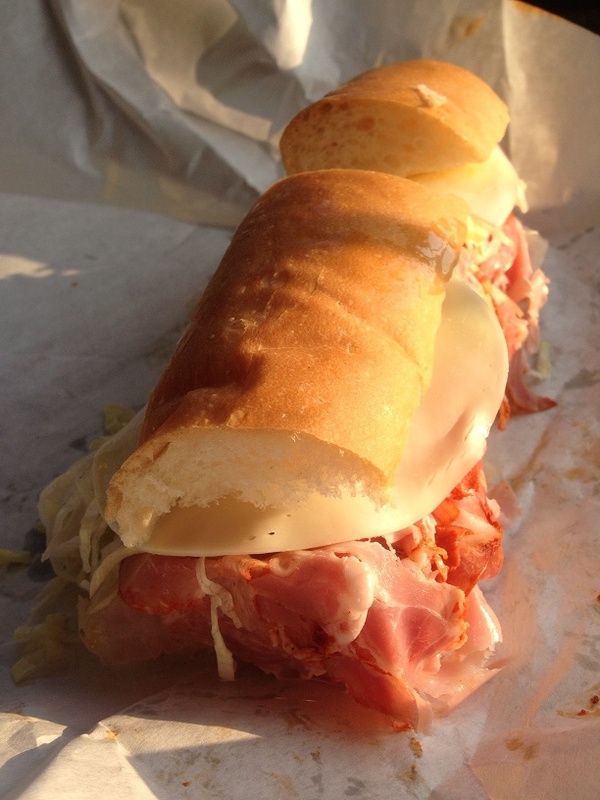 Since you went to "Grinder/Sub/Hoagie Heaven", you've seen the light! Just like those people who've never eaten a "Back East" Pizza, you don't know what you don't know. As The Astute Philosopher, Yogi Berra once said, "There are some people who, if they don't already know, you can't tell 'em." Finally made it to the Wethersfield Pizza House. They were summarily redeemed with their chicken parm. The cutlets had a depth of flavor that I didn't experience at Maple Giant Grinder or the Wethersfield Pizza House. And the peppers and cheese really spoke up, thanks to a lighter application of sauce than what I got at the other places. It's funny, because everything else about Franklin Giant Grinder is intensely unattractive, but this rather benighted-looking place, staffed by folks that would probably just as soon see you go to hell as serve you a sandwich, produced what is maybe the best chicken parm I've had out of the eight grinder shops I've tried so far. 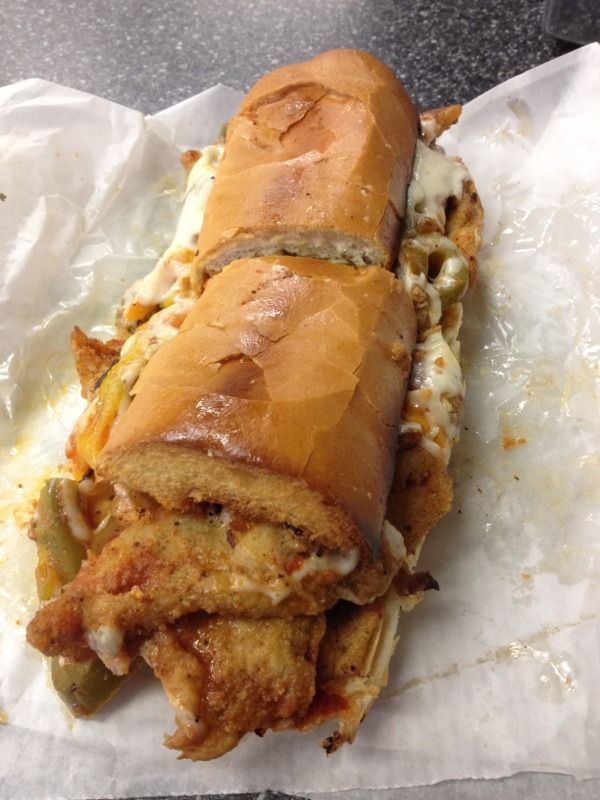 Cincinnati is certainly not a place to get great hoagies/subs/grinders, but I can also say I have never seen a chicken parm here with more than one layer of chicken. Further, I have never heard of or seen a multilayer chicken parm like that before anywhere, even after reading this website for roughly a decade now. 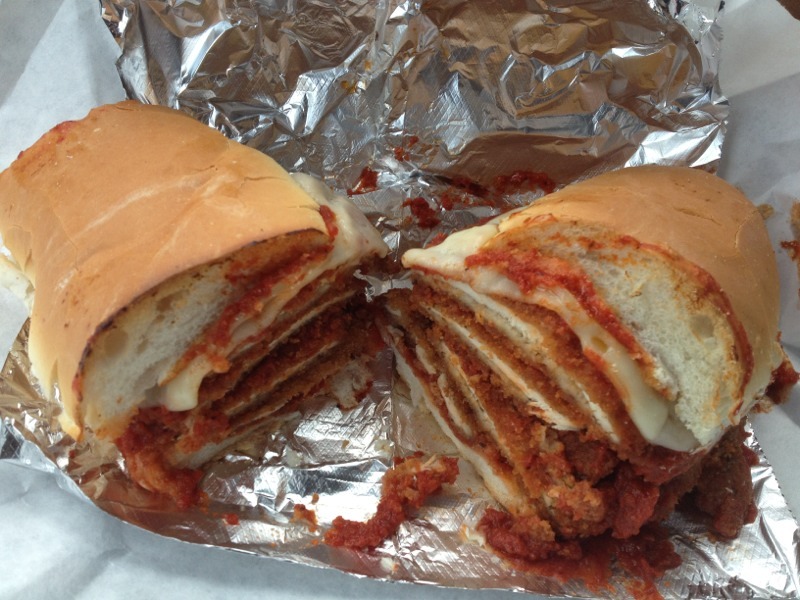 Question: how much does the pictured chicken parm from Franklin run? I am guessing it'd cost me around 20 dollars to have one constructed like that around here. The single layer version we get here at a typical pizza/hoagie joint run 5-9 bucks. 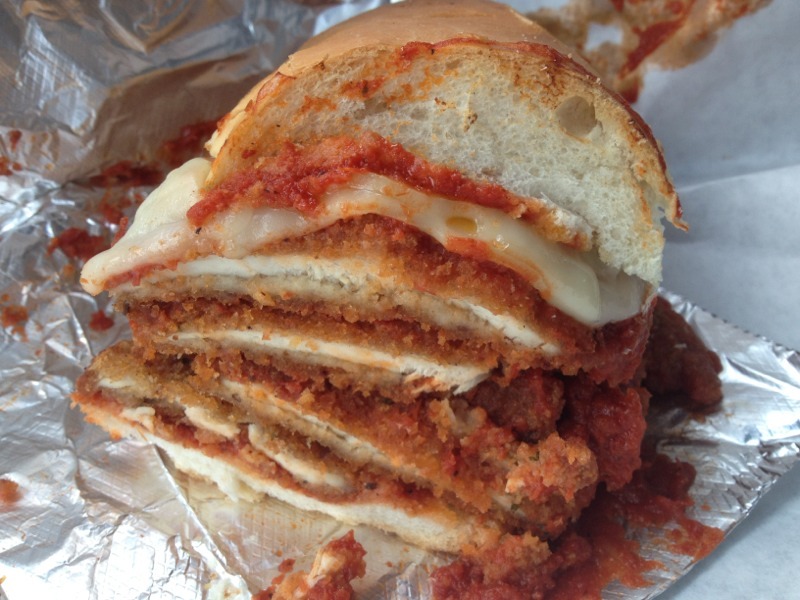 Open question to anyone/everyone not in the Connecticut area: do chicken parm subs in your area include more than one layer of chicken? Half a chicken parm is $9.20 - and a "half" consists of both sections that you see in my second photo. The whole is twice the amount and about twice the price. There's no reason to get a whole unless you're splitting it; unless you're one of those competitive eaters with a freakishly roomy stomach, there's no way you're finishing that in one sitting anyway! Good sandwiches are a way of life here - any halfway decent local joint gives you a ton of good food for your money. The only chains I've seen with any presence are Subway (which started in CT, and is the ubiquitous McD's of sub shops anyway) and D'Angelo (which is regional to New England). Quizno's and Jersey Mike's have 2-3 locations each; Jimmy John's and Firehouse Subs have zero. There's just no reason for them to exist here. Now I'm wondering if there are any grinder places where the chicken cutlets, shaved steak, etc. are cooked on the spot. I know that means slower service, and I haven't had any problem at all with how things are normally done, but I'm just curious. 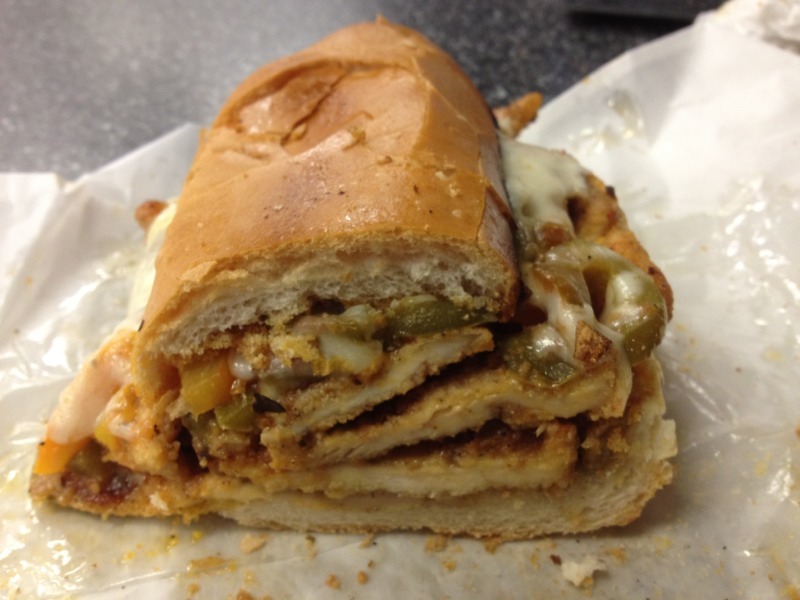 The idea of a chicken cutlet grinder being cooked-to-order is tantalizing. While I would not consider them as "grinder" places (for me, a grinder must be made on a crusty roll, suitable for oven baking), both Charley's and D'Angelos cook their shaved steak and chicken to order. Both are decent (far superior to classic sub chains), but not really of classic "grinder" quality. Incidentally, I have taken note of the non-Hartford recommendations made in this thread - it's just a matter of getting there! D'elia's in Norwich, Avventura in Waterbury, and Luliano's in Manchester are next on my list, for either this weekend or the next! I'm now convinced that the only reason I didn't like eggplant as a kid is because I never had it properly prepared. This breaded and roasted eggplant was delightful. Earthy, robust, delicious, and nicely paired with the meatballs, although the meatballs themselves were as unimpressively mild as before, despite having gone through the oven this time. 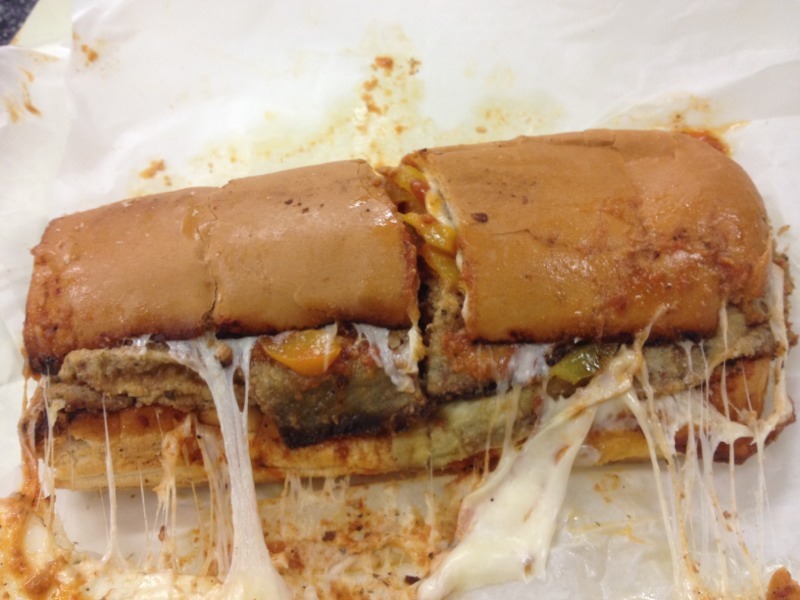 Maple Giant Grinder's meatballs would have taken this sandwich all the way to the top. Ketteract... I've been jonesing for some corned beef (odd how hard it is to find here, even though I'm like two hours from NYC; not a single one of the menus I posted above has it! ), so I was all over this sandwich. I am loving this thread!! 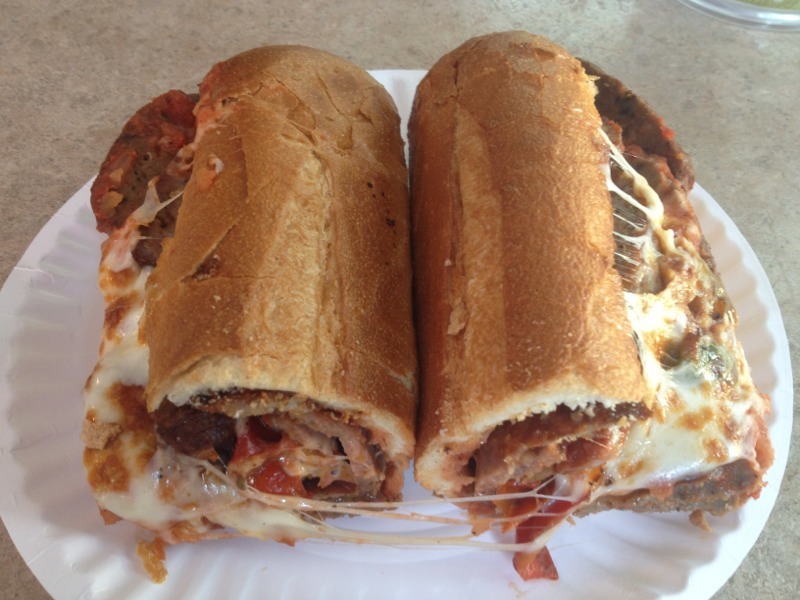 Those chicken parm grinders will be on my list soon, thanks for sharing! Today's grinder comes to you from Pizza Pete's in New Hartford, where I went antiquing today. Sausage and meatball! A little less blatantly indulgent than anything from the three big Hartford grinder shops, but definitely in their class for taste! The sausage was especially good, possibly as good as Maple's. Very friendly tableside service, too. I wouldn't go out of my way to come here, but it will definitely be on my mind when I'm in the area. I'll need to try the pizza, which is highly praised, at least on Yelp. ... and a special mention for Iuliano's in Manchester. Its only open a few days a week now but their pre-made genoa grinders are the best. Fresh baked rolls, sharp provolone and home cured peppers. Gone for good, apparently. The inside of the establishment was hollowed out. Annoyed and hungry, I walked down the street to another local place, Sorrento's, where I had a pretty disgusting Italian combo - won't even post a picture of it. It was only after I'd ordered it that I noticed their menu also included burgers, pizza, wraps, and appetizers, none of it any good I'm sure. At least I only wasted $6. Maybe it's just me.or I'm spoiled with great subs shops...but the bread in the photos above looks average at best....what non Italians would call "Italian bread". The meats, cheese, and bread were just low-quality. The veggies were okay, I guess, but when the predominant aftertaste in your mouth is onion, something's wrong. It was easy to see why the sandwich was only $6, which made me feel less guilty about not finishing it. The next place I want to try was mentioned by JB-ME early in this thread: D'elia's in Norwich. Hopefully they're still around. I agree. The subs I grew up with all came on half loaves of great bread -- crusty on the outside and tender on the inside. Shaped like the boats for which the sandwiches were named, these loaves were pointed at each end. If I could give you an example I would. But I'm in Ohio and the loaves of bread are in stores in Connecticut. 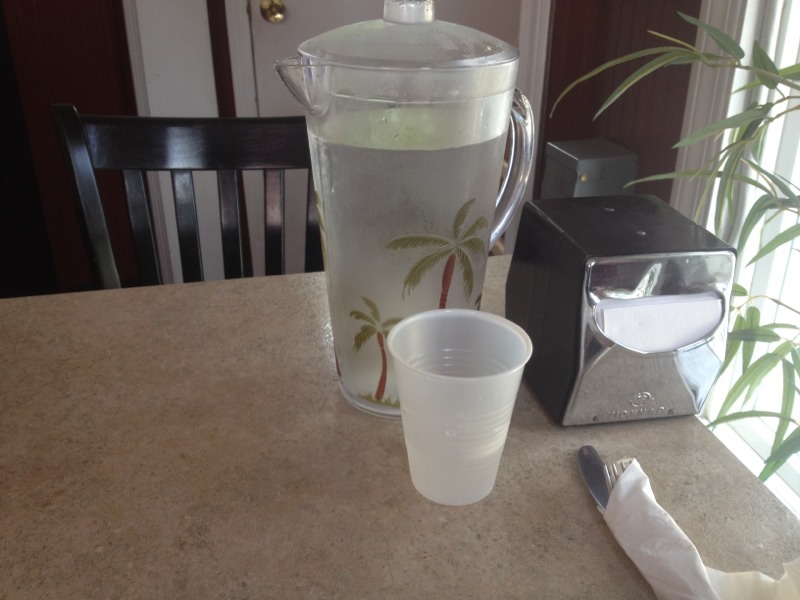 Have you tried the H&M in Windsor Locks. 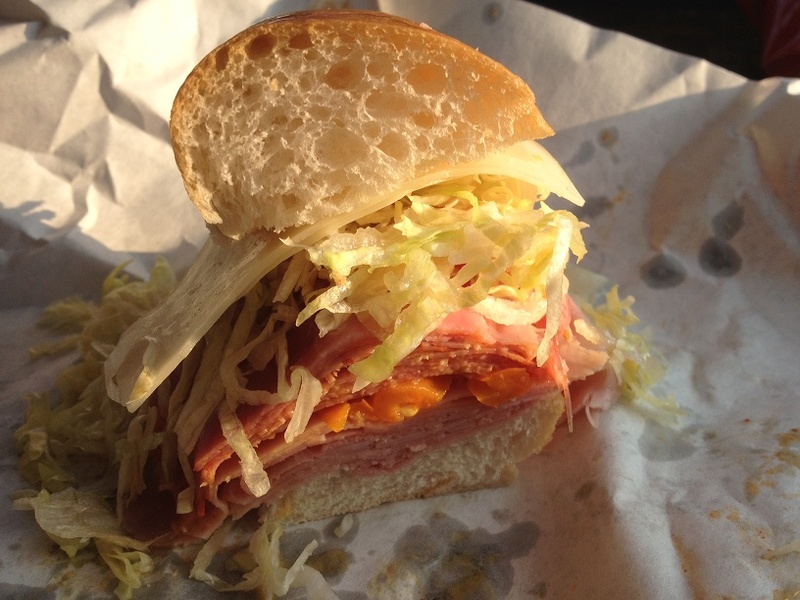 I had a great capicola grinder there. I prefer their grinder to the ones at Second Poquonock Giant Grinder. The next trip I will try to get a picture. Oooh, I just looked up H&M on Yelp and they do look promising! And more like the Hartford giant grinders that I'm now accustomed to. Aaaand less than 20 minutes away from me, meaning I may have go to there before I go to D'elia's. In a couple of weeks i'll be staying overnight in Waterbury on the way home to Virginia from Maine. I've always been intrigued by the big Nardelli's sign on 84 approaching Waterbury. 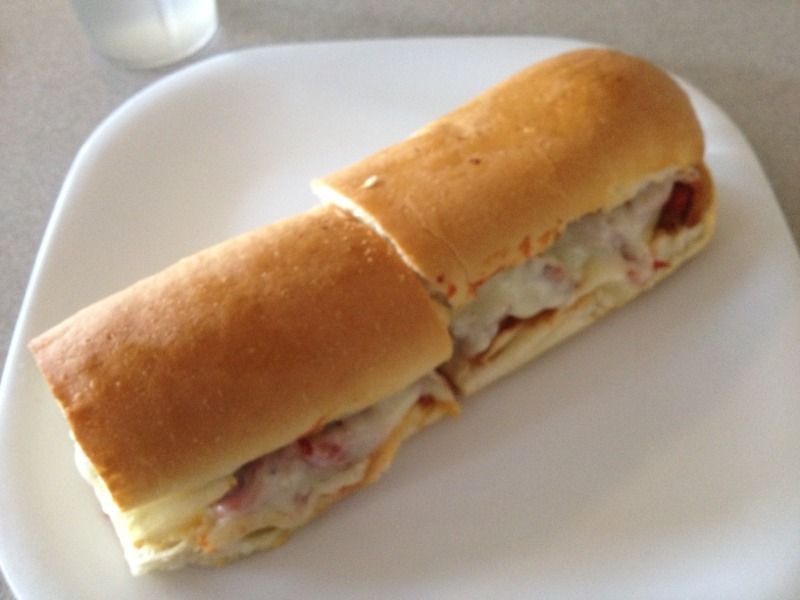 Looking for Italian combo grinder from there, or from Avventura or Cavallos. Any thoughts on those? Also, it seems mayo is pretty standard, but I can't see it on an Italian - only oil and vinegar for me. Your thoughts? Thanks, Doug in Shenandoah Valley VA. Personally, I think mayo provides a cool, creamy balance to the acidity and spiciness of the other ingredients. While you're eating, it mixes with the oil and vinegar dressing to create a delicious sauce. Overall I think an Italian sub is better with it than without it, but it's certainly not required. Really loving this thread. 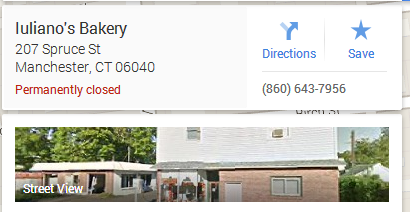 Where we are in north central CT, I have a really hard time finding places that have decent bread for the sandwich - most are fairly insipid white bread, no chew kind of places, not like the great deli bread from New Jersey, Philly, NYC. I finally tried Nardelli's after seeing the big sign on the highway (me too, valleydoug!). Their special is an Italian combo. I liked many things about it, not the least the Militti's bread they use - really fabulous. I don't do mayo on Italian grinders as a rule - just oil/vinegar. This sandwich was slightly dry, I'll ask them to add a bit next time, or get some on the side so I can adjust. While that sandwich was really great, I wasn't impressed with the rest of the menu - they had trays of pre-cooked "blocks" of foods that they would microwave and stick on your sandwich. An example - my husband got a steak and cheese - they pulled a cold, congealed block of pre-cooked steak and cheese from a tray and stuck it in a microwave, heated it and put it on his sandwich. So while the bread is amazing, I'm not overly impressed with all the (to me) overly advanced prep of the food. I need to get to some of the places Ketteract has mentioned - they are a little far to run for a quick lunch, but I've yet to find really good grinder bread for the sandwiches in this area. Thank you for telling me about this place. I went there tonight and ate what was easily the best Italian combo I've had since moving here. 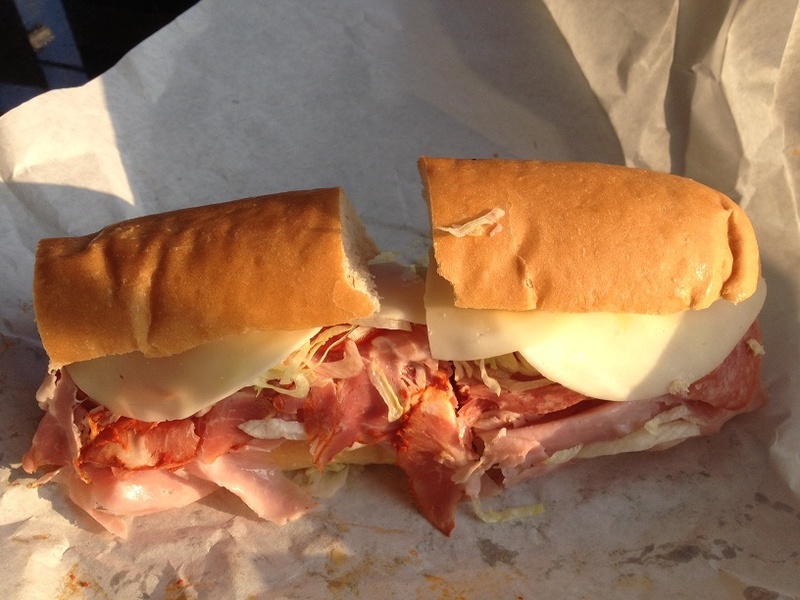 It was well above Nardelli's, and it would make a Jimmy John's sandwich weep suicidally. Luscious, salty, indulgent, wet with dressing. I've yet to have Franklin's or Maple's, but this one sets a high bar indeed. Beautiful looking sandwich! 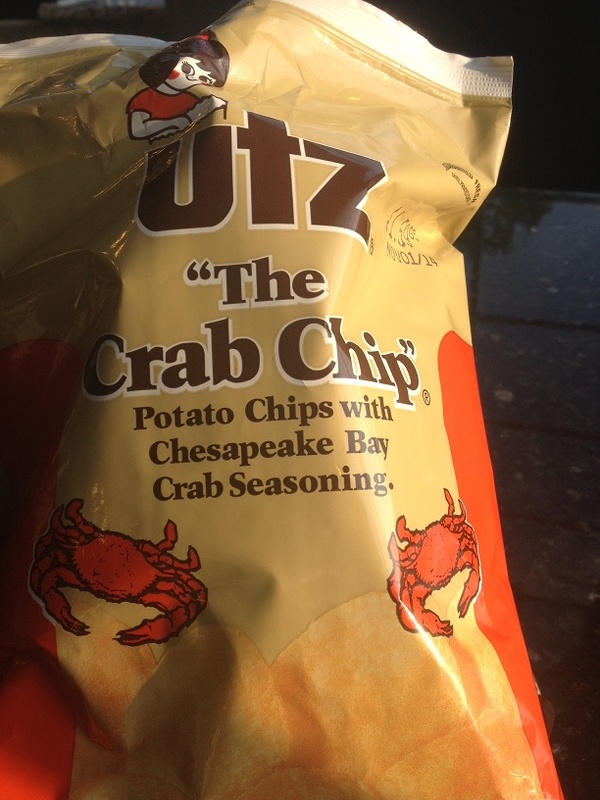 I tried Utz chips for the first time recently-just the regular ones-but was eyeballing the ones you pictured. How were they? The great part about living here is the abundance of choices throughout the state. Everyone has their favorites, but are always searching for more. 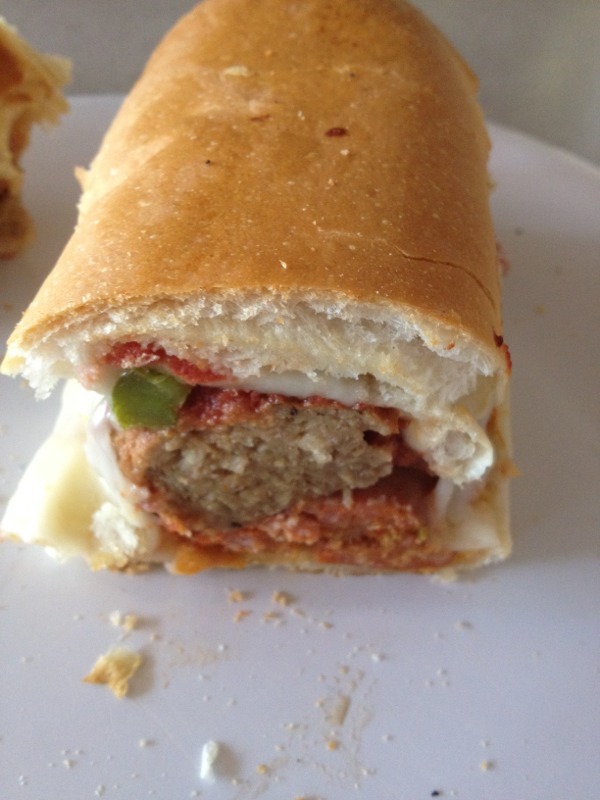 I have two local places that make excellent meatball grinders, Holiday Rest in New Milford and Bantam Pizza. I have been going to them for years and have not been disappointed. As someone who acquired a taste for cheese steaks after living in the Philly region for a few years, I am always searching for a good one. Jersey Mike's opened recently in Brookfield, CT recently and I thought I would try it. The meat, onions and cheese were OK, but the bread was not quite "Philly" type. I also felt they were a little skimpy on how much they put in it. The 6" version was $7.75 and the 12" $12.95. Since they just opened I may try them again. However, I will have my daughter bring me a "real" Philly cheese steak when she visits next time from the Philly area. Old Bay seasoning, essentially. If you like that, you'll like these! Utz and Wise seem to be the two huge brands of potato chips in this area, and I generally prefer Utz's, especially their salt and vinegar which is one of the most pleasingly acidic I've found. So many brands hold back when it comes to that variety. The great part about living here is the abundance of choices throughout the state. Everyone has their favorites, but are always searching for more. 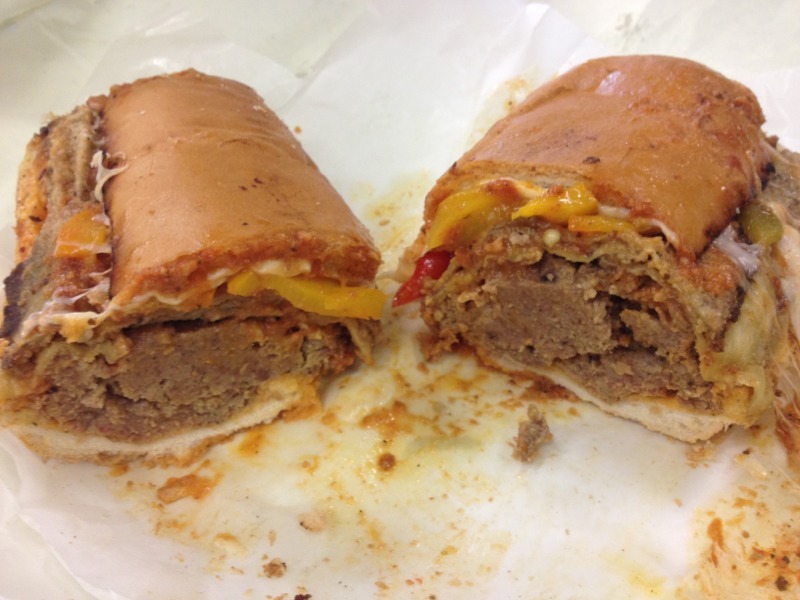 I have two local places that make excellent meatball grinders, Holiday Rest in New Milford and Bantam Pizza. I have been going to them for years and have not been disappointed. As someone who acquired a taste for cheese steaks after living in the Philly region for a few years, I am always searching for a good one. Jersey Mike's opened recently in Brookfield, CT recently and I thought I would try it. The meat, onions and cheese were OK, but the bread was not quite "Philly" type. I also felt they were a little skimpy on how much they put in it. The 6" version was $7.75 and the 12" $12.95. Since they just opened I may try them again. However, I will have my daughter bring me a "real" Philly cheese steak when she visits next time from the Philly area. 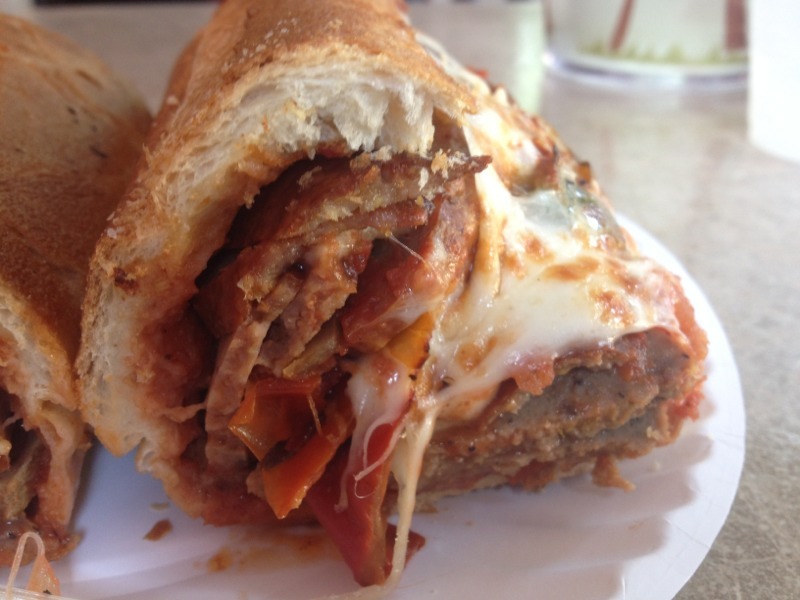 I have two local places that make excellent meatball grinders, Holiday Rest in New Milford and Bantam Pizza. I have been going to them for years and have not been disappointed. Turned out I did indeed feel like another sandwich today! I took a lovely scenic drive from Hartford to Litchfield, for the sake of Bantam Pizza. I ordered a sausage-and-meatball combo. Both meats were very flavorful, at least as good as Maple's, and the most thinly-sliced of any place I've been to here. Also, note the browning on the cheese - whatever they put on their pizza is also what goes in their hot grinders. A refreshing change from the usual provolone, and delicious! I was quite pleased! This was a fine midpoint of a beautiful drive.